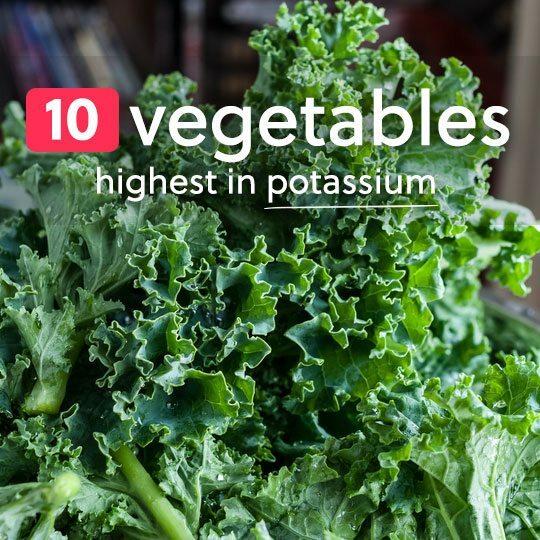 You’ll have no trouble getting your 3.5 grams of potassium when you make these vegetables high in potassium part of your regular menu. Each of them not only gives you a strong dose of potassium, but helps cover your bases with additional vitamins and minerals, fiber, and in some cases protein. It’s no surprise that spinach is one vegetable with a lot of potassium. It’s well-known for its healthy benefits, and potassium is just one item on a long list of positives. Spinach has built up its image of a healthy vegetable by bringing much to the table. It’s a good source of iron, as well as fiber, and it even provides some protein. It’s one of the most well-rounded vegetables with potassium around, and the phytonutrient content along makes it worthwhile to eat as part of an anti-cancer and heart healthy diet plan. Tips for eating more: Opt for baby spinach and you’ll have an easier time eating more of it. The baby version is smaller of course, but has a more inviting taste, gets blended up in a smoothie easier, and is readily available at most grocery stores. Kale is a nutritional powerhouse, providing a mix of vitamins, minerals, protein, and fiber that make it one of the healthiest veggies you can eat. 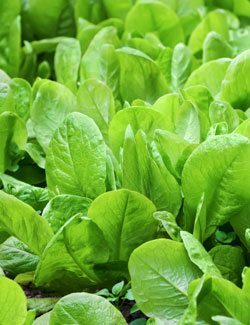 It’s also a decent source of potassium, rivaling spinach for the top spot. 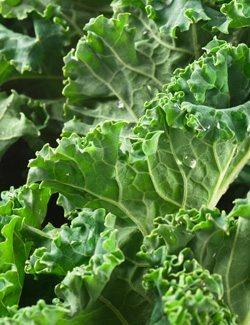 Kale is one of the more trendy vegetables, and has enjoyed a big surge in popularity in recent years. 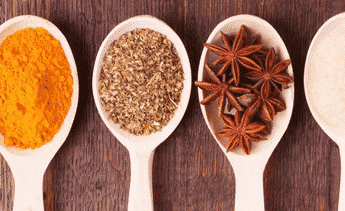 That doesn’t mean you should avoid it as a fad, as it lives up to the hype and is a vegetable that you should become familiar with if you aren’t already. It provides a nice break from spinach, and has its own unique flavor profile. Tips for eating more: Kale makes a great backdrop for a smoothie, turning it green and adding in plenty of nutrients, as well as protein and fiber. It is often seen as the base for a healthy salad, and you can also bake it up to form kale chips. It’s a very versatile veggie indeed. 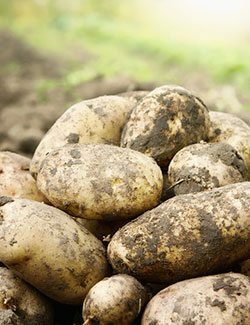 Potatoes may have gotten a reputation as being unhealthy, but that’s only because the most common ways of eating them, French fries and potato chips, don’t put it in the best light. They’re a good source of potassium, just be sure you make them in a healthier way, like baking them. You can also opt for sweet potatoes if you’d like, as they’re also a good source of potassium at 337mg (10% DV) for the same 100g serving size. They’ll also give you Vitamin A in the form of beta-Carotene, and extra fiber. Tips for eating more: When looking to eat more potatoes and sweet potatoes, it’s simply a matter of making more than you need at any one time, and saving the rest to warm up the next day. This makes it so you’ll always have a side dish option at the ready, and because they’re versatile you can mash up a baked potato so it seems like you’re having something new. Brussels sprouts might not top the list of tastiest vegetables, but they do rank fairly high for potassium. At 10% of your daily need for potassium, Brussels sprouts are right on par with some of the top fruits with potassium. Brussels sprouts are part of the cruciferous vegetable family, a group of vegetables that is consistently being linked to anti-cancer benefits. They provide fiber and a ton of Vitamin C, even more Vitamin C than an orange. We typically don’t associate vegetables with Vitamin C, but this is one source that shouldn’t be ignored. 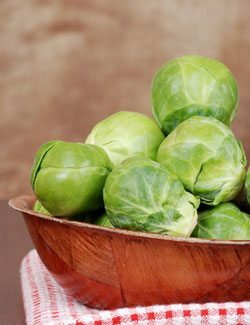 Tips for eating more: If you’ve had a bad experience with Brussels sprouts, it’s time to turn the page and give them another shot. Baking fresh Brussels sprouts doused with a little olive oil and balsamic vinaigrette gives them an amazing flavor and will load you up with potassium. Artichokes may not be the first thing that pops in your head when thinking of potassium-filled vegetables, but they merit a purchase, since they’ll give you 11% of your total need for the day, and they’ll taste great while getting it. If you’re not familiar with how to prepare artichokes for eating, it’s worth the time investment, as these are one of the tastier vegetables that offer more health benefits than just their potassium content. They may be a little off-putting because of their size and shape, but once you get a handle on taking raw artichokes and making them edible, you’ll have another tool for meeting your potassium needs. 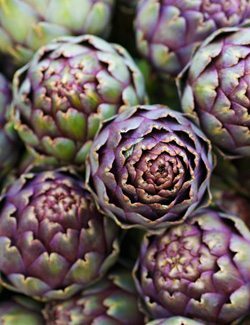 Tips for eating more: Artichokes taste great on top of a salad, and they can also be used as the centerpiece of a main dish provided you have the right recipe. Avoid dishes like spinach and artichoke dip, even though both spinach and artichokes are good sources of potassium, the high fat content cancels out the benefits. You can’t go wrong by going with portobello mushrooms when you’re looking to increase your potassium. A 100 gram serving gets you a tenth of your daily requirement, making it easier to accumulate the rest of your needs throughout the day. Portobello mushrooms are easily identifiable in the mushroom area of the produce section. Other mushrooms also provide you with potassium, such as chanterelle, enoki, oyster, and shiitake. It’s a safe bet putting mushrooms in your cart, as they’ll not only help you hit your potassium target, but they also contain additional vitamins and minerals, as well as fiber to help your overall health. 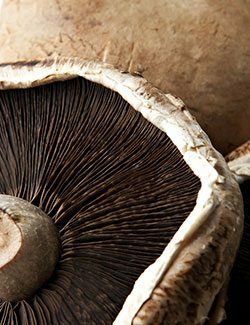 Tips for eating more: You’ll often see portobellos used as a meat substitute, either as a steak substitute for something like steak fajitas, or a beef stand-in for a burger. They also taste great grilled up and placed next to a grilled chicken breast. Winter squash will bring you much closer to hitting your requirement of 3.5 grams of potassium each day, with 10% coming from a 100 gram serving. Winter squash, as the name implies, is best eaten in the winter, as it is harvested at the perfect time to help us through the cold winter months. 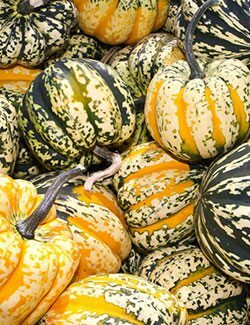 Depending on the season you may find different squash types are more available than others. Acorn squash is another excellent source of potassium, so consider going with that when there’s no winter squash available. Tips for eating more: Baking your squash is the best way to go, as it softens it up to the point of being al dente, and locks in plenty of roasted flavor. 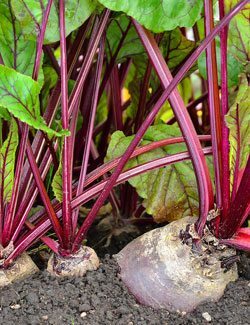 Beets have been making health news in recent years because of the betalin they contain, a powerful antioxidant that is only found in a limited number of foods. They’re also a quality source of potassium, and will contribute to your total for the day. Beets provide a great amount of fiber as well, and if you consume the 100 gram serving that nets you 9% of your potassium, you’ll also be getting 10% of your fiber for the day. They’re also rich in magnesium and iron, and even provide some protein. Tips for eating more: If your only experience with beets is the pickled variety found at the salad bar, it’s time to upgrade that experience. Buy fresh beets, cut them into cubes, and placed them in a single layer on an oiled baking sheet. 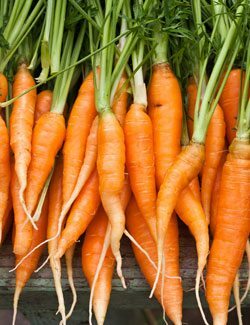 Carrots are known for their beta-Carotene and ability to help improve eyesight, but they’re also a good source of potassium, making out list in the number nine spot. Carrots also contain fiber, as well as some Vitamin C, so it’s really not just a matter of eating them for their potassium, but because they offer a broader nutritional profile. These are a crunchy vegetable that you should get more of because they benefit several areas of the body with their nutritional makeup. Tips for eating more: Roasting carrots gives them an entirely different flavor than when they’re raw. You can also add them to a smoothie, or juice them if you’re not in the mood for so much crunching. It’s a bit shocking that broccoli barely makes our list of potassium-rich vegetables. It has so many healthy properties that it’s often referred to as one of the healthiest veggies on the planet. Broccoli is so good for you than some health experts recommend eating it everyday. It’s a great source of fiber, and the same 100 gram serving gets you 10% of your daily value of fiber. You’ll also get 5% of your protein for the day since broccoli is a good source of plant protein. Because of the fiber and protein you’ll feel full longer, making broccoli a fantastic choice for weight loss. 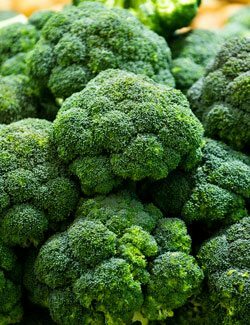 Tips for eating more: Broccoli is a great vegetable to roast. You’ll know it’s ready when the outer ends of the florets start to turn brown. They’ll be soft on the inside with a bit of crunch on the outside, and a delicious flavor. Helpful info, but you didn’t include the quantities.. You mention 100g on potatoes and portobellos–does 100g apply to all of them to get this amount of potassium? Thank you.